Hadoop Common: These are Java libraries and utilities required by other Hadoop modules. These libraries provides filesystem and OS level abstractions and contains the necessary Java files and scripts required to start Hadoop. Hadoop YARN: This is a framework for job scheduling and cluster resource management. 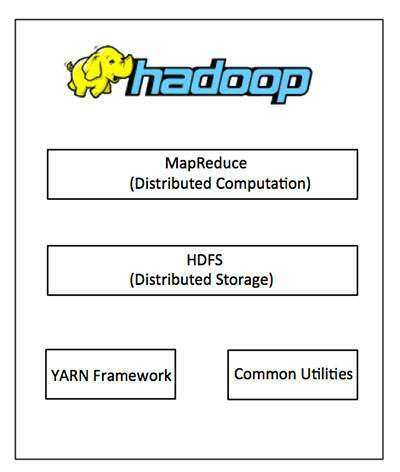 Hadoop MapReduce: This is YARN-based system for parallel processing of large data sets. We can use following diagram to depict these four components available in Hadoop framework. Since 2012, the term “Hadoop” often refers not just to the base modules mentioned above but also to the collection of additional software packages that can be installed on top of or alongside Hadoop, such as Apache Pig, Apache Hive, Apache HBase, Apache Spark etc. Hadoop framework allows the user to quickly write and test distributed systems. It is efficient, and it automatic distributes the data and work across the machines and in turn, utilizes the underlying parallelism of the CPU cores. Servers can be added or removed from the cluster dynamically and Hadoop continues to operate without interruption. Another big advantage of Hadoop is that apart from being open source, it is compatible on all the platforms since it is Java based.